There's good, bad, and just plain ugly to be found among corporate share buyback programs. PepsiCo gives an example of a judicious, not-overdone buyback. Oracle provides one example, among others, of a bad buyback. 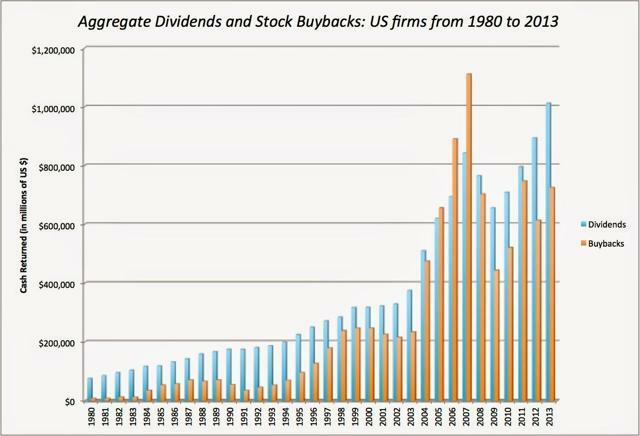 What has caused such a massive surge in corporate buybacks since the early 2000s? What is the difference between a good corporate share buyback and a bad one? Is there such a thing as a good share buyback? From a finance perspective, yes, there is such a thing as a good share buyback as a tool in the financial management tool belt. 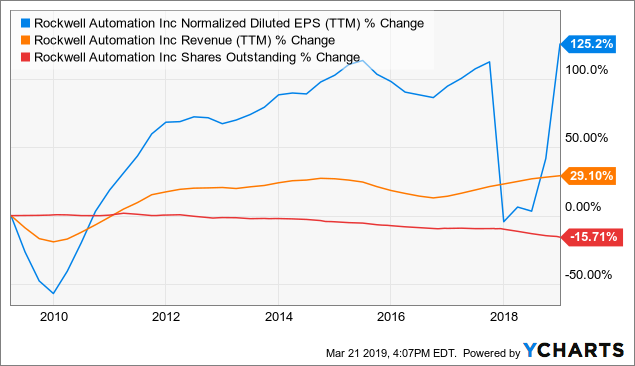 Consider the case of a profitable, dividend-paying company which has had some unflattering news come out, driving the stock price irrationally low. The company already has a number of projects in the pipeline which are expected to lift revenue and profits in the future, and there are no new announcements which can be made that would elevate the stock price. 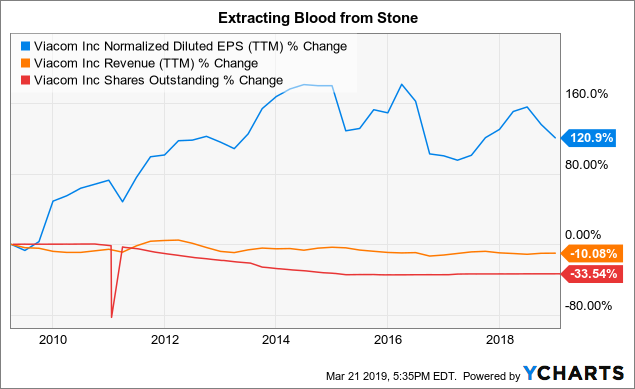 The company could announce a higher-than-usual dividend hike, but that comes with it the implicit promise of heightened dividend payouts in the future and will indefinitely eat into retained earnings. One thing the company could do is use retained earnings to pay down debt. This would increase future free cash flow, but the effect on the stock price is not immediate. But company executives also note that with the stock price low, the dividend yield has risen above its average range. Perhaps it's even around or above the company's average cost of debt. 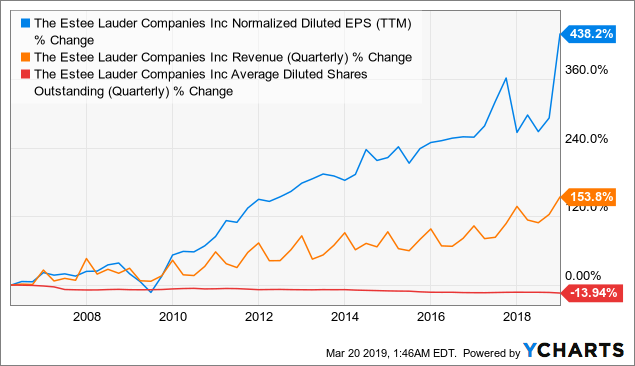 Another option, then, is to use retained earnings to buy back the company's own shares and retire them, thus reducing the total amount paid out to shareholders as dividends. This also has the pleasant effect of immediately reducing the share float, thus decreasing supply of the company's stock while leaving demand otherwise unaltered. 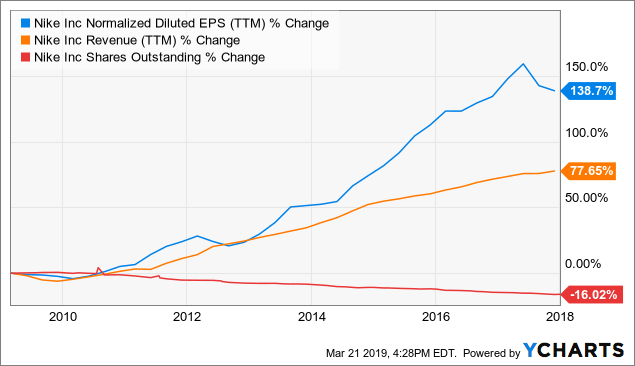 If the company's stock has a 3.5% dividend yield, repurchasing stock not only lifts the stock price, it also guarantees the company a 3.5% return because it decreases the total amount paid out to shareholders by that amount. It's a bit like someone using their excess disposable income to pay down the principal on their mortgage. If their mortgage interest rate is 3.5%, then any amount paid down on the principal is a guaranteed 3.5% return. This is an example of a "good" share buyback. Thus, buybacks can indeed be part of wise financial stewardship and shareholder value creation. When used well, share repurchases should not contribute to extensive, sustained gaps between revenue performance and earnings per share performance. Let's look at a few real-life examples of good share repurchases. Beginning in 2013, PepsiCo has repurchased shares sparingly, and as such, revenue and earnings per share have grown around the same pace. 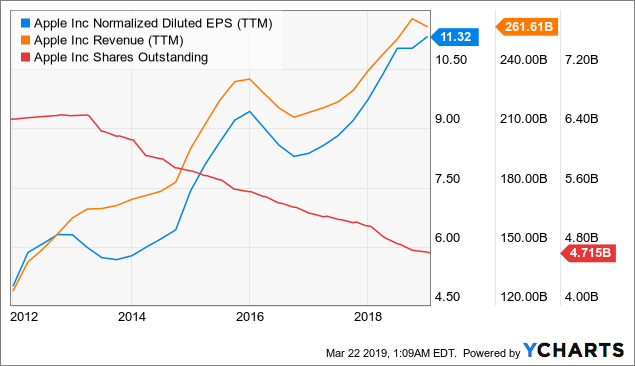 However, given that PepsiCo is only moderately levered at 2.52x total debt to EBITDA with an average cost of debt of 3.46% and a dividend yield averaging ~3% since 2013, judicious share repurchases have not been a bad use of capital. In the midst of the continued share repurchases over the past twelve months, insiders have acquired about as many shares as they've disposed of, on net. Johnson & Johnson has repurchased even fewer shares as a percentage of their total shares outstanding. 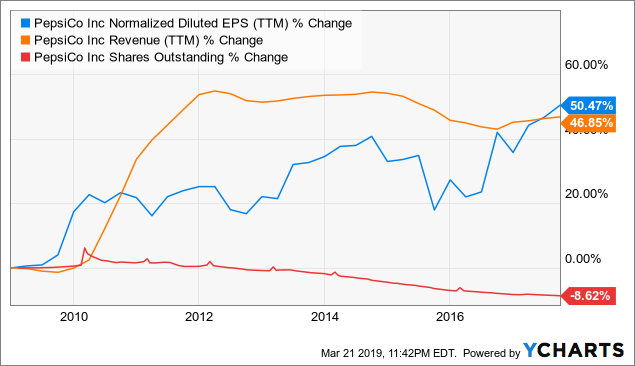 Again, we find revenue and EPS growth more or less in-line, albeit with a few big swings in earnings performance. All we need to do to illustrate a "bad" share buyback is change the inputs. Let's say the stock pays a 2% dividend yield, and that yield is actually below its recent historical average. The company also carries a fair amount of debt with an average interest rate of 4%. The company stock is also not really underpriced but rather fairly priced. 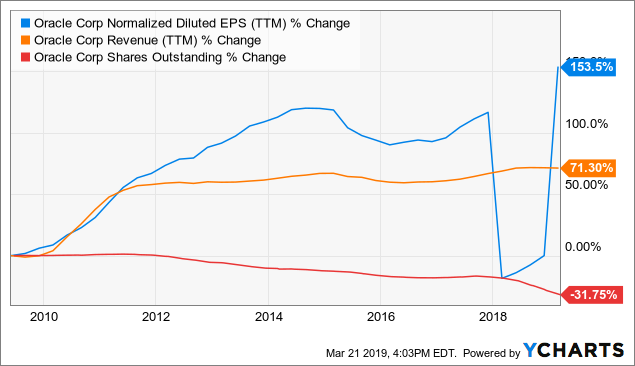 Let's also say that the company devotes some of its retained earnings to projects which are expected to generate increased future revenue/profits, but they devote the same amount or more to share repurchases. In fact, to many observers, it appears as if the company's share buyback program is crowding out investment. This is obviously a bad use of buybacks. Not only is the 1.5% guaranteed return (from the dividend yield) minuscule, it's also significantly less than the return from paying off debt and it's likely crowding out revenue-generating investment. Moreover, it also diminishes cash on the balance sheet, thus leaving the company in a more precarious position if projects don't perform as expected or if the economy slumps into a recession. So why would so many corporate executives engage in buybacks anyway? One reason, as many have observed, is that corporate executive pay is often tied to stock performance. Yes, the people who fill C-suites are self-interested human beings like the rest of us. But if that were the only reason for (or rather the only effect of) buybacks, shareholders and the board of directors would quickly catch on and chastise the executives, if not replace them. 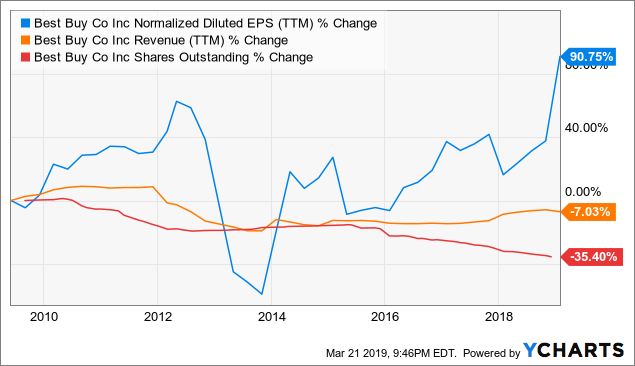 Another reason - this one favorable to executives and shareholders alike - is the positive effect on profitability measurements such as earnings per share (EPS). If buybacks can raise earnings per share by a few d to get it up to company guidance or analyst consensus estimates, it might be worth it. Short-term-minded shareholders - both retail and institutional - are apt to punish the stock for missing guidance. Yet another reason, perhaps a bit sneakier on the part of executives, is to use corporate buybacks as an opportunity for insiders to exit positions in their company stock holdings, as recently discovered by an SEC investigation. Indeed, as reported by Barron's, this phenomenon has been significant in recent years. Notice below that EPS growth really broke away from revenue growth at the beginning of 2012, when the share repurchases began in earnest. And yet, despite the recent increase in the magnitude of share repurchases, insiders have disposed of almost 11 million shares while acquiring none in the last twelve months. Share repurchases over the previous decade have contributed to EPS growth growing multiple times faster than revenue. And yet, even as share repurchases have ramped up in the past year, insiders have net sellers of the stock by an overwhelming margin - disposing of 5.7x more shares than they've acquired. Revenue growth has been steady since the recession, but buybacks have juiced EPS a little higher. Meanwhile, insiders have been net sellers of the stock for years. No insider has purchased shares on the open market since March 24, 2017. Again, sustained share repurchases have detached EPS growth from revenue growth. Meanwhile, insiders have been net sellers at a 36:1 ratio. 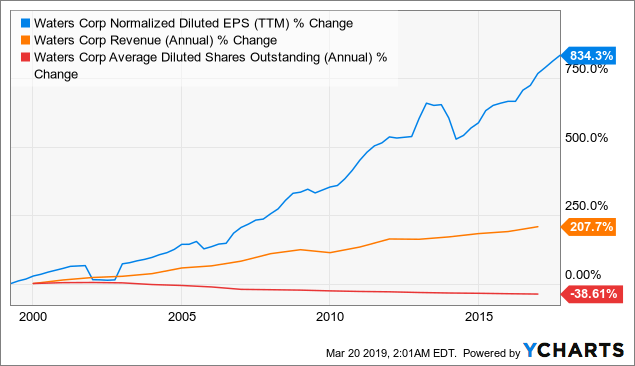 Here the gap between EPS and revenue is a bit more modest as buybacks have taken a less significant chunk of shares out of the market. And yet, again, insiders have been net sellers. This one might ruffle some feathers. After all, Apple has been a phenomenal investment over the past ten years. But I'm not arguing that it has not been. I'm arguing that its share repurchase program has been more or less a waste. It was instituted initially to cushion wavering EPS but stuck around because shareholders got used to it. Perhaps management found it a convenient tool to consistently meet guidance. 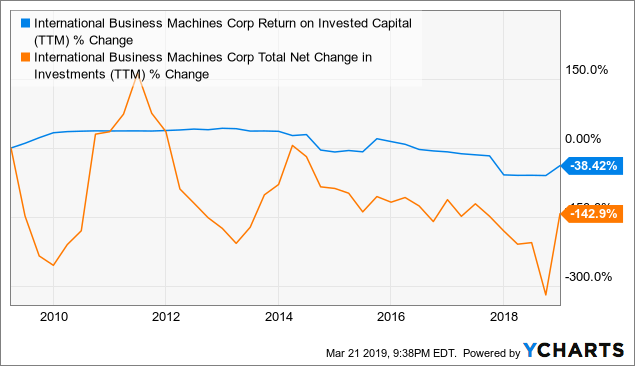 And yet, as management has been sending the signal to markets that their stock price is undervalued (enough to use the company's cash to repurchase), they have been net sellers by an almost 15:1 margin in the last twelve months. 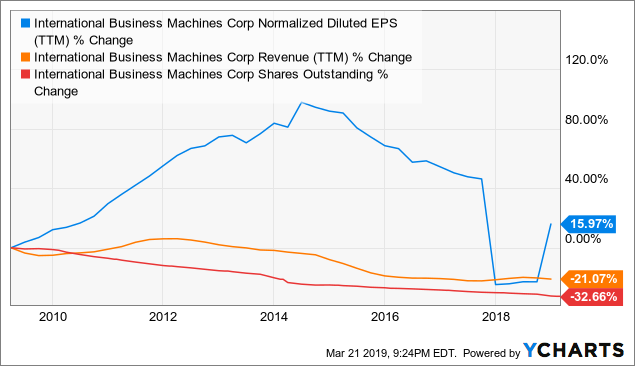 There's one more reason why executives might engage in buying back shares, and this one is perhaps the worst of all: to conceal the true weakness of the company's results. As Andy Serwer of Yahoo Finance notes, the executive team at Sears employed billions in buybacks from 2005-2007 in an attempt to save a poorly performing company, but that money would have been much better if kept in cash in order to weather the Great Recession. While Sears' revenue was falling, its earnings were padded by the buybacks, making it appear as if the company was doing better than it was. The financial sleight of hand worked for a while, but it was doomed to fail eventually. There is some data that suggests a decent number of stocks may fit into this category of "ugly" buybacks. Of the 250 companies in the S&P 500 that bought back shares in 2018, 57% underperformed the market as of the end of Q3. The multimedia conglomerate has poured billions of dollars into share repurchases while many of its assets have languished from underinvestment. Paramount Pictures, for instance, has suffered years of operating losses and dwindling market share (though this past summer's hit movies may mark a turnaround). What has parent company Viacom done with its profits instead of investing in its brands and assets? Well, as you can see below, it has bought back a third of its shares since the Great Recession. And this generous repurchase program has helped to ensure steady profitability, despite falling revenue. "Big Blue" is a case, sadly, of a once-great innovator pausing for a breather only to find out that its competition had passed it up. Slowly realizing its place in the world had changed, the company attempted to alter course. But such a move has proved unwieldy. The company's trademark supercomputer, Watson (or at least its predecessor, Deep Blue), is now over twenty years old. The computer wiz hasn't proven has profitable as initially thought. And Big Blue's competition in the cloud space is stiff: Amazon Web Services, Microsoft Azure, and Google Cloud, to rattle off a few. What has IBM done to dig itself out of this hole? Double down on corporate investment? Unfortunately, no. As we can see below, both total net investment (orange line) and return on invested capital (blue line) have decreased markedly since the Great Recession. What it has done, as we can see above, is repurchase about a third of its shares outstanding. The electronics seller has suffered from intense competition with lower-priced retailers such as Walmart and e-commerce (i.e. Amazon). Revenue has fallen 7% since the trough of the Great Recession. And yet... what is that I see? A 90% rise in earnings per share? How can it be so? Well, having 35% of shares outstanding gradually disappear doesn't hurt. Why the Surge in Buybacks? In the last twenty years or so, we've witnessed a veritable revolution in stock buybacks. Why? Why would corporations be allocating so much precious capital to a non-productive, non-revenue-generating use such as buybacks? Is it simply the evils of shareholder capitalism coming to full bloom? Has the Gordon Gecko philosophy finally come to dominate Wall Street? I think not. As I've said before, human nature is a constant. Is it because of the SEC's rule change in 1982 allowing share buybacks? Again, I don't think so. 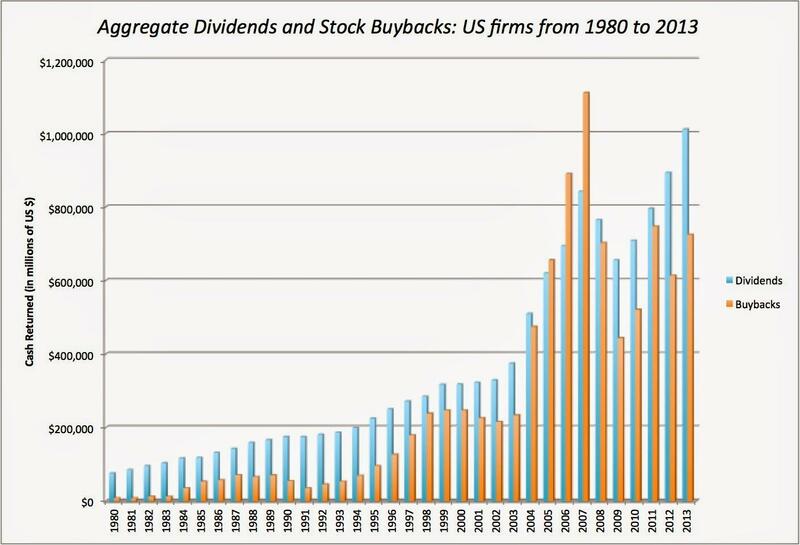 If corporations were bursting at their seams to buy back their stock in the early 80s, we would've seen an explosion of buybacks after the rule change. We didn't. We saw only gradually growth in buybacks until the early 2000s - twenty years after the rule change. Corporate investment as a percentage of GDP has been declining since the early 1980s. It's been shrinking even more dramatically as a percentage of corporate profits or total market capitalization. But what else has been declining since the early 80s? Interest rates. The real reason so much corporate money is being poured into buybacks is that capital is so cheap. The most obvious way this affects buybacks is through the practice of taking on debt in order to buy back shares. 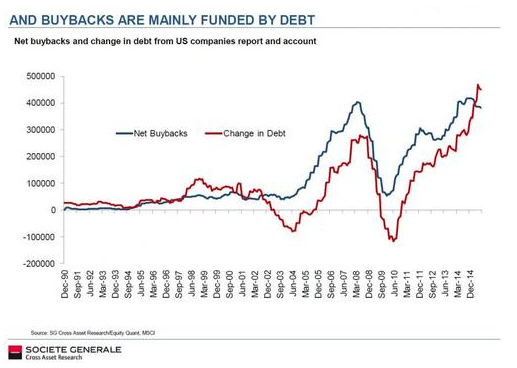 Certainly, since around 2003-2004, buybacks have closely tracked corporate debt issuance. The rise of buybacks typically lags the drop in interest rates by a few years as falling rates have corresponded without fail in recent decades to the onset of recessions when corporate profitability shrinks and restricts the ability to engage in buybacks. But leveraged buybacks are not the only way that lower interest rates have fueled the buyback revolution. Cheap capital has not only made it cheaper to repurchase shares via debt. It has also translated into lower hurdle rates. The hurdle rate is the minimum required rate of return to consider an investment or allocation of capital. When interest rates are relatively high, the hurdle rate of investment in risk assets must necessarily be higher because investors can just as easily put his or her capital in far less risky Treasuries. All risk assets are compared to the returns of other risk assets. Equity assets are compared to the returns of debt assets, debt assets are compared to the return of Treasuries, and the various durations of Treasuries are compared to the Federal Funds rate, set by the Federal Reserve. Thus, we find that yields of equities taken as a whole have compressed right along with interest rates. While the S&P 500 yielded above 6% in the early 1980s when interest rates were high, the index's yield has shrunk to between 1 and 2% since the early 2000s when the Fed Funds rate was lowered below 2%. Ultra-low interest rates have made the hurdle rates for all sorts of one-time, ultra-low return investments (like buybacks) feasible. When interest rates are in a historically normal range, cost of capital (including debt and equity) restricts the spectrum of potential investments to those which will actually increase total revenue and profits over time. 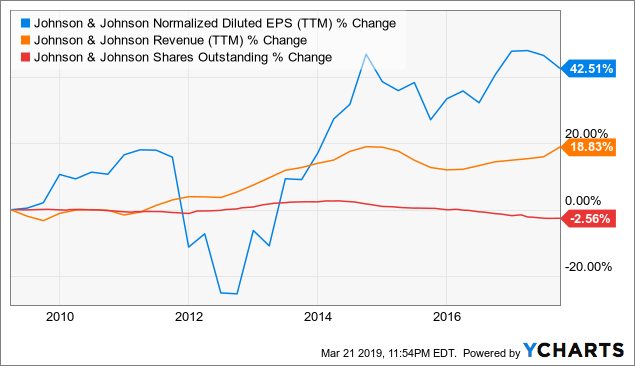 Buybacks obviously do not increase total revenue or profits (though they do increase the attractiveness of profitability metrics such as price-to-earnings, price-to-book, etc.). The best they can do is raise EPS by a few percentage points. Here is my prediction: As long as real (inflation-adjusted) interest rates remain at or just barely above zero percent, corporate buybacks will remain elevated. If my thesis about what is fueling the surge in buybacks is correct, then no legislation would be nearly as likely to succeed in curbing buybacks as would a fundamental change in monetary policy toward market-determined interest rates. Ultra-low interest rates in combination with tax cuts have resulted in a new record of $1+ trillion in corporate buybacks in 2018. This year is shaping up to break the record again. If you can think of any good, bad, or ugly uses of buybacks, let me know in the comments! Disclosure: I am/we are long PEP. I wrote this article myself, and it expresses my own opinions. I am not receiving compensation for it (other than from Seeking Alpha). I have no business relationship with any company whose stock is mentioned in this article.